What does it cost ...? The short answer is - your painting will be priceless ! A very important occasion in your life will be recorded for family history and will be enjoyed and treasured for generations to come as art in your home - an every day reminder of your special day. 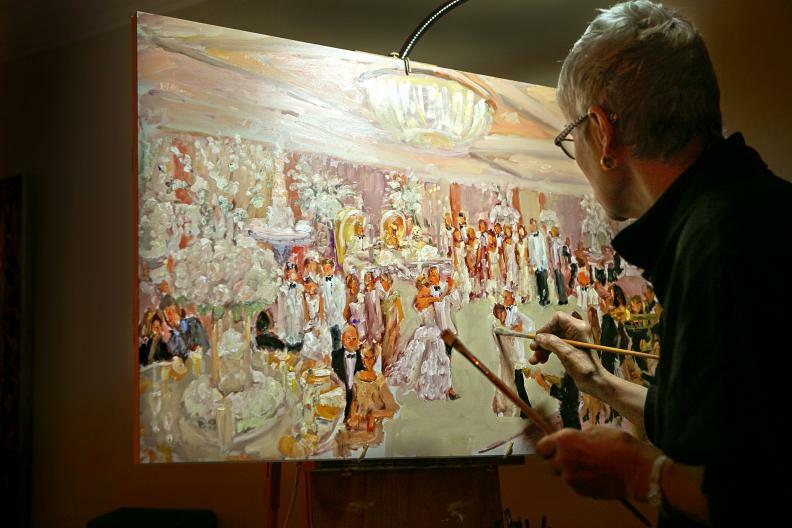 And surprisingly, compared with other wedding expenses, my fees are relatively modest, considering that you will have the paintings forever and that they are truly original and unique to you. 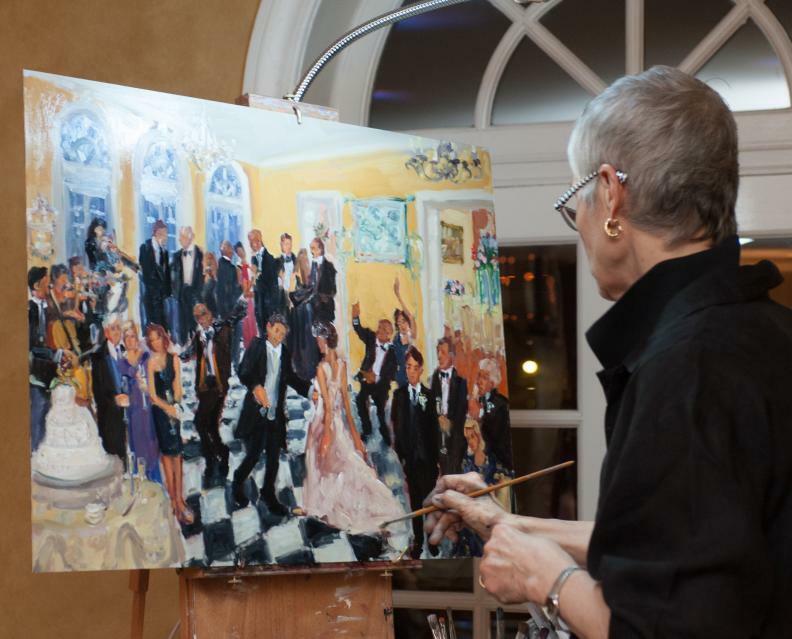 In addition, I paint in oils, which keep their brilliance and show each brush stroke that captures the story of your event. In other words, it will be a painting that is interesting to look at, and not just a picture. Live paintings: from $3500, depending on the size and location. As I am based in Philadelphia PA, out of town expenses apply for locations more than 30 miles from Center City. The fee includes your priceless oil painting, pre event discussions, customised archival quality materials, table easel for display, and Vendor's Insurance for $1 million, and my imaginatin and ability to create magic for you. Most popular sizes: 20x30", 24x30" and 24x36"; other/larger sizes are available. Additional Paintings: In addition to the main painting, I may be able to do extra smaller paintings for family and friends, eg. 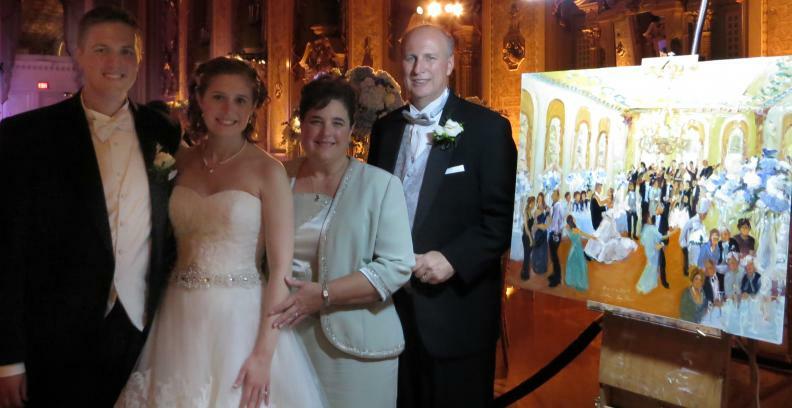 the Bride will commission a painting of the Father Daughter Dance as a special gift for her Dad; or I may be asked to paint live at a wedding reception where the guests have more time to watch me ... and then paint the ceremony from photos. Some parents ask me to do another painting based on the original so that they can have one for themselves! These paintings are usually done from photos in my studio and can be unique gifts for special thank you's. There are many sizes for studio paintings ranging from 5x7". Where is the Venue? My painting prices are for bookings within a 30 mile radius of center city Philadelphia. When I finish painting very late at night and the journey to and from the venue is more than an hour each way, I shall require overnight accomodation, so that I can put all my energies into painting for you, and, if necessary, look at your painting with fresh eyes before handing it to you the next day. Most areas within 2.5hrs drive of Center City Philadelphia: $650. For long distance venues, I usually fly in the day before and leave later on the day following the event, or on the day following that, allowing me me to look at your painting with fresh eyes and and work on it if necessary. 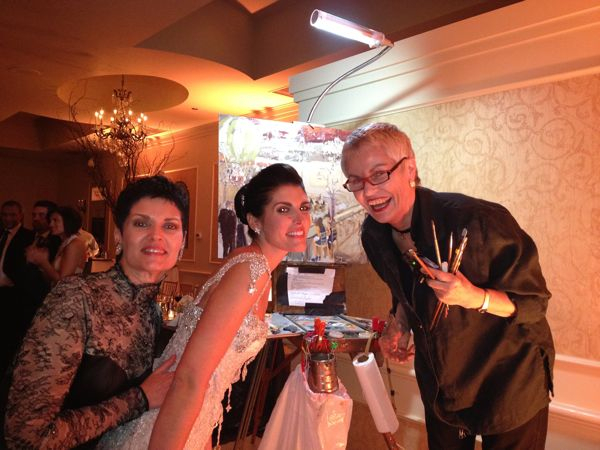 My primary concern is to make your painting FABULOUS. 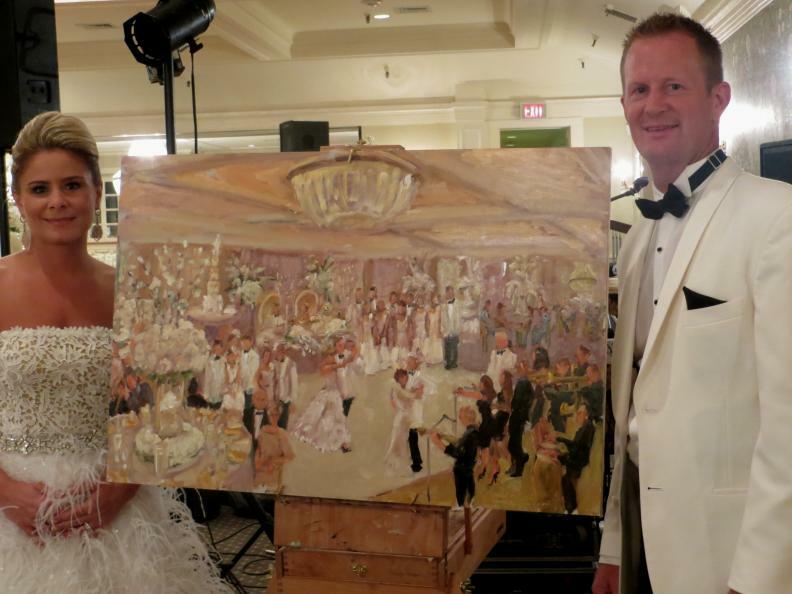 Gifts for Bridal Couples, VIP's or Honorees: My paintings are often commissioned as gifts for the Bride and Groom, (especially form parents), VIP's or honorees, who will never forget the event or who gave it to them. I have also had parents who decided to keep the wedding painting for themselves - to become an inheritance - and others who have asked me to duplicate the painting so that they could also have one. 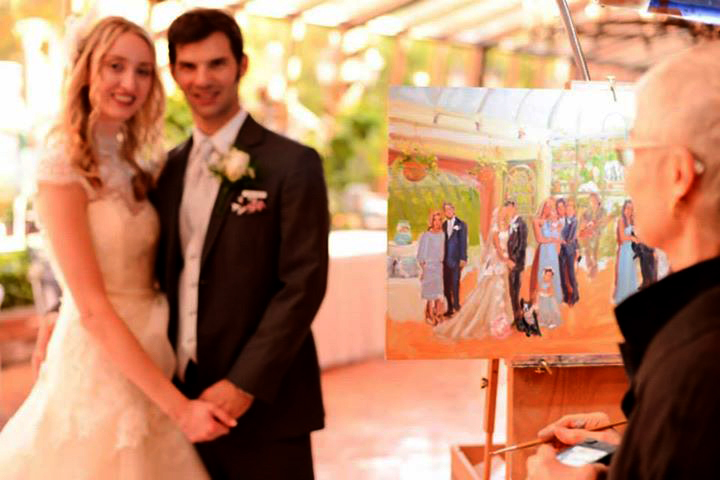 Joint Gifts from Groups of Guests: Groups and families will often combine resources to have me paint at their event, and brides can ask guests to book me to paint as a really special group gift. Prints and Notecards: Parents and clients often asked for a prints of the paintings and I can also supply a digital image for your printer to print notecards.